I just love Easter! It is truly the sign of Spring. One of the best things about Easter or Passover besides chocolate, Easter Lilly’s, chocolate, ham, chocolate, spring clothes, chocolate and hard-boiled eggs is creating fabulous recipes with your leftover food! But one thing that is a tad hard for me is coming up with creative fun recipes using your leftover food. So today for #SundaySupper we are sharing with you recipes to make with your leftover food. I already got a sneak peek at some delicious looking recipes, so be sure to check them out at the end of the post. One thing I always have leftover is hard-boiled eggs. I tend to make a lot of them because I like to color them the night before Easter. It’s always been a family tradition. So with my leftover hard-boiled eggs I made for you Chunky Healthy Egg Salad. 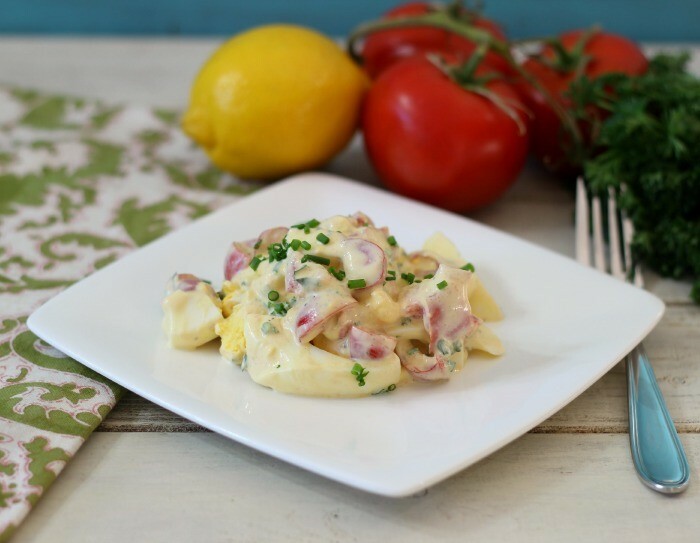 My egg salad is so light, creamy, chunky and healthy and full of flavor. I never make egg salad until Easter time, I don’t understand why? Because it is so good. My egg salad is a little different from the traditional egg salad because it is made with tomatoes, chives, parsley greek yogurt, lemon juice and a pinch of mayonnaise. No one can tell it is healthy for you! It’s also so pretty when you put it together. Just look at the fresh tomatoes and herbs with my eggs. What I like about this salad is that the hard-boiled eggs are cut into sixths so it’s nice and chunky. Plus adding tomatoes gives it a little bit of a different flavor. Egg salad is so versatile when it comes to flavor. If you like heat to your egg salad, add a pinch of cayenne pepper or siracha sauce. Yum! I have to share with you how to make the perfect hard-boiled egg. This recipe will give you perfect eggs every-time and one thing is, don’t use just bought eggs from the grocery store otherwise they are hard to peel. Add eggs to a pot and just cover with water. Run the pot with the eggs in it under cold water for 2 minutes. In a medium pot, add eggs and add water to 1 inch above the eggs. Bring to a boil, cover and simmer for 15 minutes. Place the pot with the eggs in it and run cold water into the eggs for about 1 minute. Wait for eggs to cool, than peel the shell. 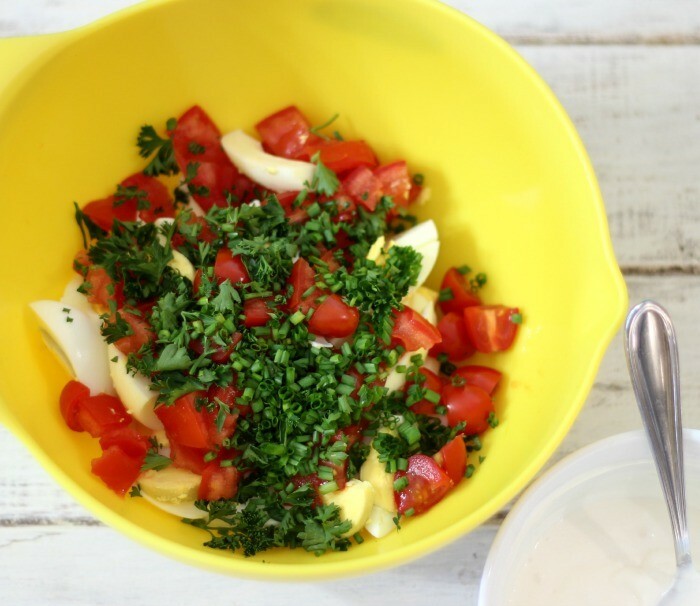 Slice the eggs into sixths, add to a bowl with tomatoes, chives, and parsley. Gradually mix together. In a small bowl, add greek yogurt, mayonnaise, onion powder and lemon juice. Mix until well combined. Add to the egg mixture and mix until well incorporated. Taste test to see if you need salt and pepper. Serve as a sandwich, top on crackers or serve on a bed of lettuce. Cover and refrigerate for up to 2 days. If you have hard boiled eggs, skip the first step. To make lower calorie and less cholesterol, add more egg whites and take out some of the yolk. Place the egg shells in your garden for extra nutrition in your garden, plus put around plants to keep snails away. This salad is perfect to eat on its own or served on a bed of lettuce, on crackers or as a sandwich. To make it fewer calories you can always add more egg whites and take out some of the yolk. My basil has been gnawed by something but I have no idea what because I never see the culprit in action. I’m going to try your egg shell trick and see if it helps! What a lovely egg salad, Jennifer! I’ve put herbs but never tomatoes and now I can’t imagine why not! Basil is such a strong herb, that it surprises me that something eats it. The egg shell trick did work for me. Also spray your plant with dish soap and water combo. That seems to work too. What a marvelous egg salad! I never would have thought to add tomatoes, but I love this idea!!! Hope you have a terrific Easter!!! Thank you Liz! Happy Easter to you and your family! I’ve never thought to add tomato to egg salad. Brilliant idea as they go so well together. Leftover eggs from Easter are always my fave! I love this chunky egg salad! Thank you Nichole! 🙂 Happy Easter! 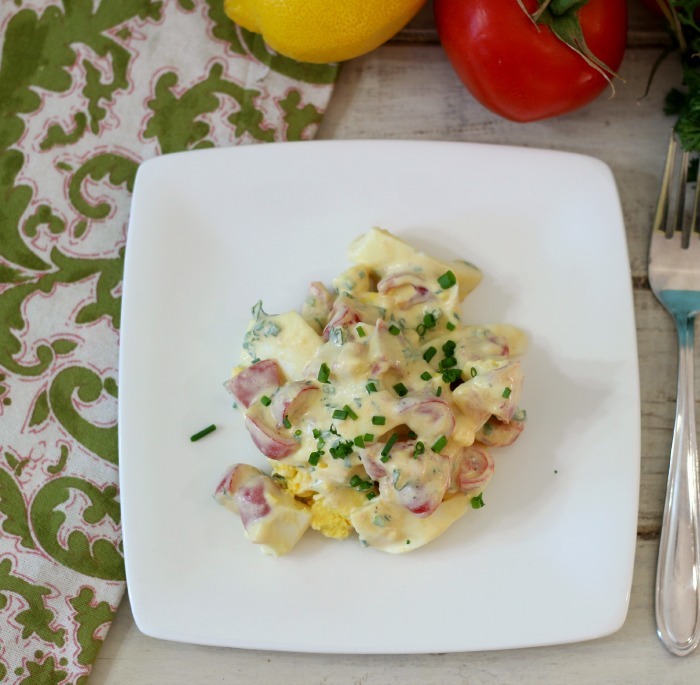 So many awesome egg salad recipes this Sunday! I especially love how chunky this one is. All the texture has got to be just amazing! Thanks for sharing this! 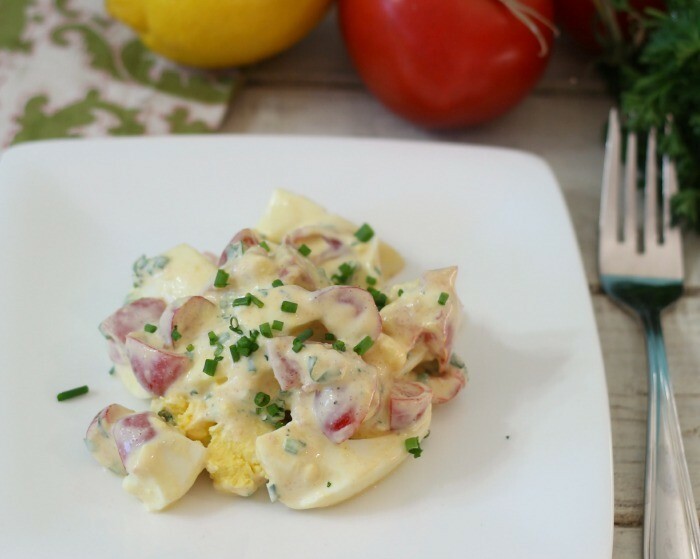 I am a huge fan of egg salad and I love the use of yogurt in your recipe! Looks wonderful! 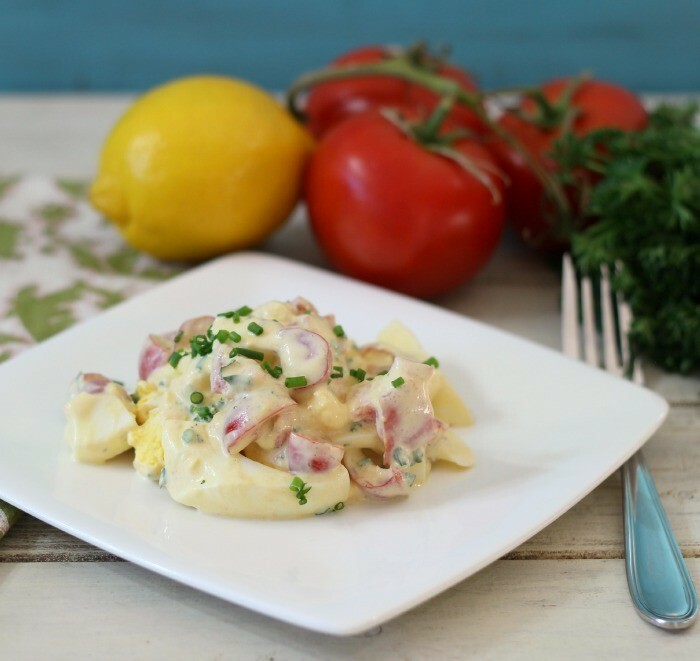 Your egg salad looks so creamy and delicious! I love the Greek yogurt in there!! 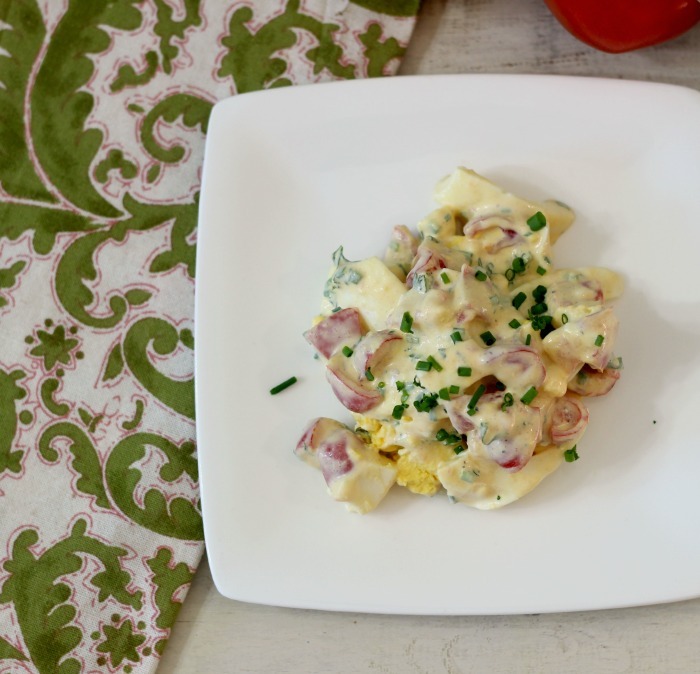 I have been seriously craving egg salad lately so this recipe comes at the perfect time! !